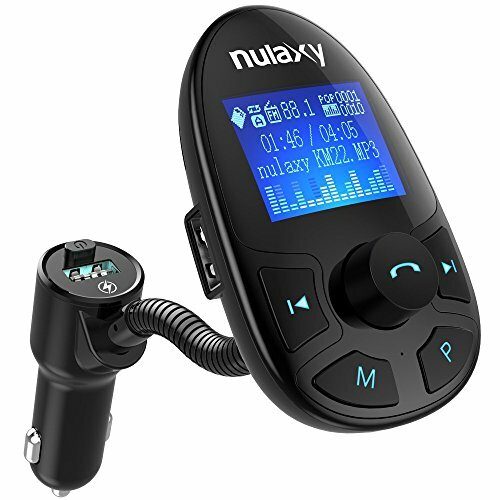 Description: Nulaxy KM22 is the best selling FM transmitter on the market, has been consolidated by uniting quality and high technology. - VOLTMETER FUNCTION: Safety when driving is our first concern, so we equip our devices with voltmeter. You can now check the car voltage before your trip or daily ride. Battery between 14.8V to 13.4V is high when your car is on and moving. Battery between 12.8V to 12.2V is normal when your car parked and power off. Battery below 12V change the battery as soon as possible. - GREAT ADVANTAGES: Compatible with most devices on the market (Apple, Samsung, Xiaomi, Oppo, Sony) you will not have problems with compatibility. Play your favorite songs in the sound of your car through Bluetooth, TF Card, Aux Cable. Advanced noise reduction system will guarantee you a quality crystal clear sound. - NEW SPORT DESIGN: Redesigned screen and buttons to meet the needs of our customers, always special treatment for our Nulaxy customers. Nulaxy KM22 has a special function which is the sleep mode. More safety in the care of your car battery. FOLDER function gives you access to the files on the screen of your KM22, only Nulaxy. - BIG LCD DISPLAY: KM22 bluetooth fm transmitter developed with 1.44 inches screen to better visualize your phone calls, musics, car battery voltage. Ideal sized screen to assist drivers without disturbing the experience while driving safely. - TECHNOLOGY IN YOUR CAR: With our wireless radio adpter you will add in your car: 1) Bluetooth connection; 2) Answer phone calls with a click and safely while driving; 3) Voltmeter function to control the quality of your car battery; 4) 4 different ways to play music in your car and more.